Parker Ranch is a working cattle ranch on the Island of Hawaii in the U.S. state of Hawaii, now run by a charitable trust Parker Ranch Foundation Trust, www.prft.org. The ranch was founded in 1847 and is one of the oldest ranches in the United States, pre-dating many mainland ranches in Texas and other southwestern states by more than 30 years. Spread across approximately 130,000 acres (53,000 ha) of the island, Parker Ranch is among the nation's largest cattle ranches. A cowboy on the ranch is called a paniolo (Hawaiian language pronunciation of Spanish: Español), since the first cowboys were Spanish-speaking and came from California. The Hawaiian language does not have the "s" sound. During World War II, part of the ranch was used as a United States Marine Corps training base called Camp Tarawa. The Second and Fifth Marine Divisions conducted training maneuvers there in preparation for the assault of Iwo Jima. 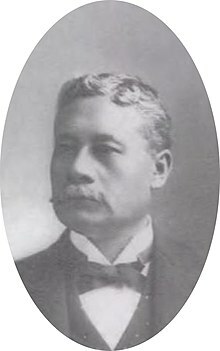 The founder of the ranch was John Palmer Parker who assisted Kamehameha I in ridding the island of feral bulls and was granted land on which he established the ranch. From 1899 to 1937 it was managed by Alfred Wellington Carter (1867–1949). The last owner of the ranch, the actor Richard Smart, died in 1992, after which the Ranch was governed by the Parker Ranch Foundation Trust. The Parker Ranch Arena and a racetrack are located off the Hawaii Belt Road at coordinates 20°0′34″N 155°40′17″W﻿ / ﻿20.00944°N 155.67139°W﻿ / 20.00944; -155.67139Coordinates: 20°0′34″N 155°40′17″W﻿ / ﻿20.00944°N 155.67139°W﻿ / 20.00944; -155.67139. The Ranch holds its annual July 4th Rodeo and Horses races at this Historic location. The Mauna Kea Beach Hotel, developed and constructed by Laurance S. Rockefeller, on land purchased from Parker Ranch. 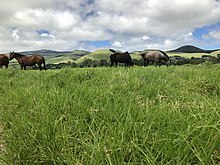 Following a successful grass-fed beef trial on Hawaii Island, Parker Ranch and Ulupono Initiative announced the launch of the Paniolo Cattle Company, a joint venture aimed at statewide local beef production in March 2014. Paniolo Cattle Company began with 1,400 head of cattle to be raised at Parker Ranch. This represented the largest commitment of grass-fed beef by a single ranch in the state and increased the supply of grass-fed steers to the market by nearly 35 percent. The Paniolo Cattle Company grass fed beef can be found in island Safeway stores. ^ "Parker Ranch Foundation Trust – Foundation Trust". Retrieved February 4, 2019. ^ "Hawaii Ranch: Parker Ranch, Big Island Hawaii". official web site. Parker Ranch, Inc. Archived from the original on July 4, 2010. Retrieved March 17, 2010. ^ "Parker Ranch Visitors Center and Museum". web site. Hawaii Museums Association. Archived from the original on July 17, 2009. Retrieved March 17, 2010. Joseph Brennan (September 2004). Parker Ranch of Hawaii: The Saga of a Ranch and a Dynasty. Mutual Publishing Company. ISBN 978-1-56647-682-9. Dr. Billy Bergin. Loyal to the Land: The Legendary Parker Ranch, 750–1950. University of Hawai‘i Press. ISBN 978-0-8248-2692-5. Dr. Billy Bergin. Loyal to the Land: The Legendary Parker Ranch, 1950–1970. Volume 2: The Senior Stewards. University of Hawai‘i Press. ISBN 978-0-8248-3086-1. Wikimedia Commons has media related to Parker Ranch. "Welcome to Parker Ranch Center". store directory web site. Retrieved March 17, 2010.